Cool! I didn't know they were converting this one. This is great! This one is going to have alot of units. 57 Bond Street, which developer Alchemy Properties says is the first new resdiential condo development in the area in more than 50 years, has sold out. The development includes 10 loft-style apartments ranging in size from 1,470 to 2,512 square feet, and priced from $1.34 million to $1.97 million. The project is reaching completion as other bigger developers are starting to see the promise of the area, said Kenneth Horn, president of Alchemy. "Now, big players like Avalon and Related Properties are constructing large-scale luxury residential projects nearby at the Bowery and at Houston Street to build upon the success," he said. The 57 Bond Street apartments feature 11-foot ceilings and marble and Pietra Cardosa stone living rooms with oversized full-height glass walls, among other amenities. Each residence also features a private balcony or terrace. The building was designed by Meltzer/Mandl Architects. Copyright 2003-2004 The Real Deal. Vikram Chatwal's Hampshire Hotel Group has scooped up SIR Studios' mid-block building at 310 W. 52nd St. to create a development site that can hold a 37-story residential tower. Hampshire Hotels already owns the Howard Johnson's next door, and would have moved forward with its plans with or without SIR, said Michael Johnson, president of Studio Instrument Rental New York. In order to keep the studio from becoming "landlocked" — which would reduce the value of the property — SIR's partners decided to sell for what sources said is approximately $9 million. Chatwal has already hired Eric Anton and Ron Solarz of Eastern Consolidated Properties to sell the site — which could hold up to a 250,000-square-foot tower — for as much as $50 million to $60 million. Anton and Solarz declined to comment. As the Post previously reported, the SIR business already leased space at 475 Tenth Ave. and on 25th Street, where it will continue its traditional instrument and high-tech musical computer rental operations. It is also opening a new studio. "We will be giving peace and harmony to the studio clients," said Johnson. The West 52nd Street site has become legendary for hosting pre-tour practice sessions for such bands as the Rolling Stones. It also frequently hosts showcase sessions for new bands and album releases. Also, in reference to that Bond Street Apartments article, that building was completed awhile ago already. New Jersey-based Garden Homes Development has emerged as the winning bidder for Beth Israel Hospital's coveted Singer Division property at 170 East End Ave. and two adjacent apartment buildings. Garden Homes is also busy converting 37 Wall St. to rental apartments and recently converted 75 West St. as well. On the Singer site, Garden affiliate Skyline Developers plans to create luxury condos that will take advantage of East River views. Beth Israel was repped by CB Richard Ellis's Darcy Stacom and Bill Shanahan, who declined comment. Other sources told my colleague Lois Weiss that the property fetched a staggering $185 million, or $770 per buildable square foot — believed to be a record price for a residential site. RFR Realty head Aby Rosen, one of the disappointed under-bidders, told Weiss: "I hope they choose a great architect because the city needs great architecture and this is a one-time opportunity." Meanwhile, Garden Homes is eying a prime development site on Sixth Avenue in the 20s, where luxury apartment towers are fast replacing grimy old structures and parking lots. Sources say Garden Homes is buying the small corner building at 100 W. 25th St. now occupied by a deli and antique galleries. It's also bidding on the much larger property next door: a 17,600 square-foot, Con Ed-owned parking lot. Cushman &amp; Wakefield's Andrew Behymer is fielding bids for Con Ed but would not comment. However, sources say bids may top $300 per buildable square foot. Under new zoning, a 177,000 square-foot building can go up as of right. It's also bidding on the much larger property next door: a 17,600 square-foot, Con Ed-owned parking lot. It's been a parking lot for as long as anybody can remember. Now, developers Hunter Lipton and Edmond Li want to construct a nine-story apartment building on the site at 51-53 Walker St. But they won't be getting started just yet. At a hearing yesterday, the city Landmarks Preservation Commission sent architect John Cetra back to the drawing board to change the design of their proposed 15-unit condo building so it will fit better with the streetscape of the Tribeca East historic district. Commissioners' criticism focused particularly on the top floors of the building, which they said looks more like a rooftop addition than an integral part of the structure. All contents © 2004 Daily News, L.P.
TREVOR Davis is tak ing a break from joint venturing with the German-born duo of Aby Rosen and Michael Fuchs. "We are finishing what we have done. We are doing other things, and he is doing other things," Rosen said. Davis brought in Rosen and Fuchs — and their RFR Holdings — as joint partners into their first city development at 300 E. 64th St., and they remained loyal. Of course, they made a ton of money while maintaining a good guys/bad guy routine. Davis, the South African-born construction kingpin and head of Davis &amp; Partners, has a penchant for big guns, big-game safaris and big residential buildings that carry names like the Impala and the Empire. With him at the helm of the joint residential projects, the team butted heads with community leaders, renters, subcontractors, luxury condo buyers and the New York Attorney General's office. The salvos skimmed off the back of the 6-foot-plus Davis. But privately, even as preservationists hailed Rosen and Fuchs for their restoration work on their own commercial projects — including the Seagram Building and Lever House — the duo were affected by the slash-and-trash style of their residential partner. Rosen said he and Fuchs are completing the development of Park Avenue Place, at 60 E. 55th St. next to Heron Tower, and have about two dozen units left to sell at 425 Fifth Ave., along with some at the Seville. Meanwhile, he noted, Davis has found a new partner in the Chetrit brothers. He is working with them to convert the Empire Hotel by Lincoln Center into luxe condos and to create another luxury residential tower over the commercial offices buildings at 400 and 404 Fifth Ave. — similar to the one he created with RFR at 425 Fifth. "They have chosen to partner up on exciting and successful developments in the past, and will continue to do so in the future," said spokesman Steve Solomon on behalf of both Davis and RFR. "They have options of working with other partners as well. They remain friends and will continue to share office space at 400 Park Ave."
Rosen and Fuchs have most recently teamed up with Ian Schrager to convert the Gramercy Hotel into luxury condos and will develop other luxury condos on the former Richard Born-owned site on Bond Street. "All the approvals are in place," added Rosen. When the Maidman family and Pine Equity NY bought a Chelsea apartment building three years ago, they expected to hold on to the property for years. But after renovating it and turning it into corporate housing, leased to Marriott ExecuStay, the owners received several bids from suitors wanting to buy the property. Eventually, they got one that was too good to refuse. “We generally buy and hold properties, but when we analyzed the potential profit from a sale versus the stream of income from the Marriott lease, it made sense to sell,” says Mitchel Maidman, president of Townhouse Management. Townhouse and Pine Equity bought the building in June 2001 for $63 million. After nearly three years and $10 million in upgrades, they recently sold to London-based Berkshire Capital Group and Lend Lease Real Estate Investments for $93 million. The building’s residential units were converted to corporate housing as leases came due during the first two years of ownership, and Marriott took them over on a rolling basis. Marriott’s 15-year lease is in place until 2017. The property includes a 50-car garage, which is leased to an operator, and 150 feet of retail fronting Seventh Avenue, with spaces occupied by a deli, a linen shop, a clothing store, a barber, a newsstand and Mullen’s Pub restaurant. Except for the restaurant’s, the tenants’ leases expire in the coming year or can be terminated by the landlord. Rents for the retail spaces average $50 per square foot, well below market rate. “I assume the new owner’s game plan would be to consolidate some of the spaces and get a name-brand tenant,” Mr. Maidman says. Such tenants have shown interest in the location in the past. The sale also included a neighboring three-story building at 167 W. 23rd St., which is leased to a liquor store. When the Maidmans bought the adjacent properties, they separated them legally so that they could be sold individually in the future, but the buyers took them as a package. Townhouse is continuing to invest in apartment buildings in Manhattan. How much: $93 million, including 167 W. 23rd St.
Notice how 1 New York Place isn't even mentioned in the Trevor Davis article. Further evidence that it's dead-I doubt that it was even a serious proposal, just a vision. High-rise rentals abound in Chelsea, but how do you know which apartment building is right for you? From snobby to classy to downright suburban, all these high-rises have their own personality, so pick the one that best suits your own. You find many "single, rich young women" lounging in bikinis and Dolce and Gabbana sunglasses on the 2,500-square-foot terrace at Chelsea Towers, according to one resident. Lots of lovely ladies, as well as gym, valet and maid service to be found, but you won't find families. "Never seen a baby," says the resident. "Unless it was visiting." And it's pretty straight, despite being in Chelsea. Others characterize it as a friendly place, where the staff knows everyone by name. One resident recently moved to California and left the building sobbing, according to one doorman. "She didn't want to leave the building," he says. "She really liked it here." Prices start at $2,170 for a studio (463 square feet) and $4,495 for a two-bedroom (986 square feet). It's "almost suburban," claims one resident. Indeed, there are a number of big-chain retail shops housed in the bottom of the Vanguard Chelsea (see sidebar). And if critics slam the building as a bit bland-looking on the outside, the Vanguard Chelsea offers the greatest diversity of residents, most of whom say it is a "very friendly place." "There are investment bankers, but then there are also artists," says one resident. "Not snobby at all." Meanwhile, amenities include a 4,000-square-foot terrace, 24-hour garage and storage units. A 700-square-foot one-bedroom is $3,100, and a 1,100-square-foot two-bedroom is $4,795. The Capitol at Chelsea: Oh, boys! "Very gay and very snobby," notes one resident, of The Capitol at Chelsea. "If we see a straight person in the elevator, it's like, 'What are you doing here?'" In addition to young professionals, The Capitol at Chelsea claims a number of celebrities as residents (you'll have to do your own stalking to find out). Amenities include a roof deck (home to a weekly movie night), gym and Zen lounge with yoga studio. Maid service and tailoring are available. And downstairs, a nail and day spa is about to move into one of the building's many retail spaces. But its prices won't attract everyone. "There's no way you can afford it if you're right out of college," notes one recent visitor. Prices range from $1,900 for a studio (486 square feet) to $6,000 for a two-bedroom (1,231 square feet). Only a few months old, this 38-story building's claim to fame may be its expansive terrace with view of the water and a misting sprinkler that cools off residents. Amenities include a gym with Pilates equipment, events lounge (complete with a wet bar) and garage. Some argue that this building is "young and hip," but others claim it is still figuring out its personality. "It's brand-new, so it's a bit sterile," says one resident. "And the staff is still working out the kinks of running the place." Alcove studios range from $2,150 to $2,605., and lofts are $3,195 to $4,450. 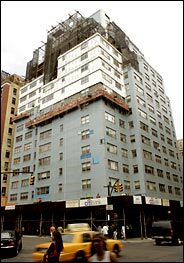 After a two-year court battle, workers are moving ahead to strip the signature blue bricks off the facade of the co-op apartment house at 27 East 65th Street, at the corner of Madison Avenue. A panel of the Appellate Division of New York State Supreme Court ruled this month in favor of the co-op board in its long-running dispute with Elliott E. Sutton, 62, a real estate investor who controls the building's ground-floor commercial space as an equal partner with the co-op board. The ruling cleared the way for the co-op board to get a $6.8 million mortgage that will refinance an existing loan and provide some $3 million to replace the blue bricks with ordinary red ones, according to Gil Feder, a lawyer for the firm Reed Smith, which represents the board. The wrangling began in early 2002, when city inspectors said the facade of the 17-story building, which was built in 1963, was in danger of crumbling and ordered a scaffold erected. Because they are glazed, the blue bricks retain water, which freezes in the winter, causing cracks and leaks. The co-op had brought in engineers, who recommended removing all the bricks and replacing them. Mr. Sutton worried that his ground-floor restaurant, Ferrier, and other tenants including a Citibank branch, would lose business the longer the project took and he argued for a quick job that would merely replace bad bricks in patchwork fashion. The two sides landed in court, and both the blue bricks and the scaffold stayed, and stayed and stayed. The co-op applied for a mortgage to finance the brickwork, but Mr. Sutton, as joint owner of the property, refused to sign the loan papers. After a series of arbitration and court decisions, a judge finally ruled that the co-op could sign on behalf of its unwilling partner. That decision was upheld by the appellate panel. Mr. Sutton, however, says he will ask the New York State Court of Appeals in Albany, the state's highest court, to take up the case. Work initially began in March after the 55 or so co-op owners agreed to a maintenance increase. The money is to be reimbursed when the loan goes through. Meanwhile, Mr. Sutton said he would soon close Ferrier because of poor business. Mr. Feder, the board's lawyer, said the work would have been done by now, and the scaffolding gone, if Mr. Sutton had not put up a fight. in a court hearing last January, Justice Jane S. Solomon of the State Supreme Court in Manhattan wondered aloud about the long-running feud. "Does your client have an emotional connection to blue brick?" she asked one of Mr. Sutton's lawyers. The judge's question was repeated to Mr. Sutton last week. "I don't care if it's blue, black, green or orange," he said. "I only own the ground floor. I don't look up." I don't like it. It looks more like a mall building than a place to live. The rendering is by Sven Johnson Illustration. Yea I'm hoping it wil look better in reality. The previous version that was killed by NIMBY's will hopefully be built on some other lot.